Brandon Graham made the second-biggest play in Eagles history. The Philadelphia Eagles will kick off their 2018 preseason on Thursday night, and while the team is mostly tired of hearing praise about the Super Bowl, Eagles fans have one last score to settle with New England. As we reported back in June, Boston resident and Philadelphia native Gina Lewis placed a little bet with her Patriots fan co-worker to prove that Super Bowl fever was alive and well months after the fact. (The fact that the Eagles beat the Patriots in the Super Bowl, thus winning, and them losing, the biggest game in pro sports, which everyone was watching). Lewis quickly got started contacting an advertiser to place the billboard and selected local artist Jordan Spector to design it. A former football player himself, Spector is well-known for his collection of Philadelphia sports art that celebrates the pantheon of local legends. To turn the project into a good cause — not just schadenfreude — Spector launched a GoFundMe campaign to raise money for both the billboard design and quarterback Carson Wentz's AO1 Foundation. The fundraiser has collected more than $6,300 from Eagles fans. But here's what we've all been waiting for — this masterpiece of in-your-face, Boston, revealed Wednesday morning. 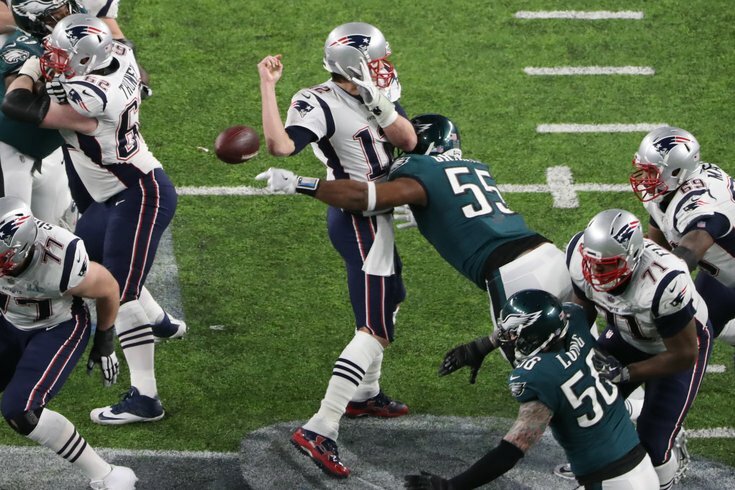 That's Nick Foles catching the "Philly Special" with the Eagles' final score on the back, Tom Brady heaving his desperation Hail Mary with the Patriots' score on his back, and Mummer Jason Kelce in the form of an underdog. It is perfection. This billboard will find its way to Route 1 in Foxborough (a slight change of plans from Boston) just outside Gillette Stadium. Prints of the design will be available for purchase at Spector's website, while 52 lucky fans who donated to the fundraiser will receive one for their contributions. The fundraising campaign remains open until Sept. 13 and has a goal of $10,000. The look on the faces of Patriots fans – counting their tainted championships, as if we care – will be priceless.